I am a runner. I run full and half marathons. I love running. But I wasn’t always a runner. I used to hate it. But that all changed when I had the life changing experience of watching my younger brother run the Chicago Marathon in 2007. It was the most inspirational thing I had ever seen. I ran the last 6 miles with him. It was horribly hot and the race had actually been cancelled for some slower runners because it was in the upper 80s. It was such a struggle for him to finish and I loved that I could be there for him that day. I knew I needed to run my own marathon. 1. Find someone to run with (a friend, a group, someone to keep you accountable and keep you company). 2. Get fitted for good running shoes and make sure to get new ones often. Many injuries occur when you don’t have the proper shoe. 3. Follow a training plan and take your rest days. The goal is to show up to the start line injury free. Doing too much too fast will result in injuries that will plague you for far too long. 4. Schedule the time to run. Your runs won’t just happen. You need to make time for them. 5. As you get closer to race day, start running in the clothes/shoes/gear that you will use on race day. Don’t wear new clothes/shoes/etc on race day. You don’t want to change things up and find out that your new shoes give you blisters or your new shirt has an annoying tag that bugs you for 13.1 miles. 6. Don’t do anything new on race day. Eat the same food the night before. Eat the same food on the day of. Try and wake up at the same time as your long practice runs. Don’t drink new sports drinks that you’re not used to on the course. Once I decided to add some pie (okay, lots of pie) to my pre-marathon dinner meal and let’s just say I spent way too much time visiting the port o pots during the race. 7. Stay hydrated during your runs. Learn how to carry and drink out of a water bottle if needed. 8. Stay fueled during your runs. Find what works for you (Gu, Cliff Shot Block, etc.) and stick with it. 9. Have your name on the front of your shirt for race day. Have shirts made with your name (although see above regarding practicing with your clothes prior to the race) or simply use masking tape to write your name. People in the crowd will see your name and cheer you on. I can’t tell you how much it helps to hear your name and an encouraging shout out when you’re feeling low during a race. 10. Enjoy the moment that you cross the finish line. Soak it in and remember it always. It’s life changing. I promise. Each time you cross one, it’s the best feeling ever. 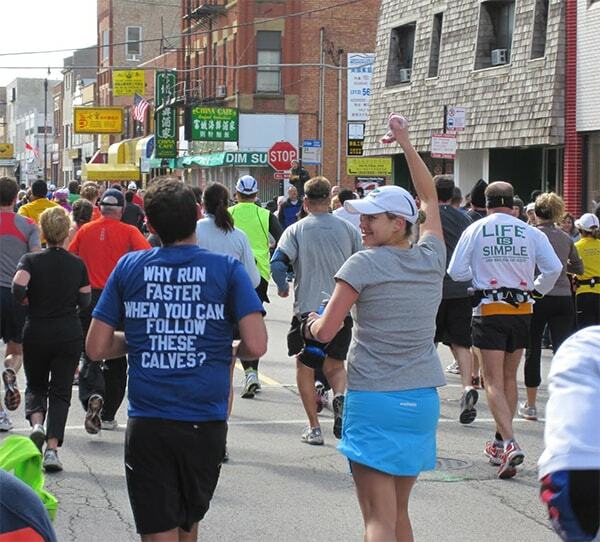 Attached is a picture of my brother and I running the 2009 Chicago Marathon. He’s wearing a shirt that I made for him. I have my arm in the air. We’re close to mile 20 and I was on top of the world. I had just seem my husband and we were almost to the finish line (kind of). Thank you, Jessica! I’m going to trust your wisdom that some day I really will look forward to these long runs! You are a rock star.